The Apple Watch is here! Each version comes in a different box – this large, heavy box is for the steel. When it was announced, it was not immediately clear exactly what Apple’s long-awaited watch was supposed to do, and Apple failed to make that case in the ensuing months. Is it a standalone device or an extension of an iPhone? Is it an interactive tool or read-only display? And, most importantly, how would the use of an Apple Watch improve one’s life? Apple has long been at the forefront when it comes to designing and selling electronic gadgets based on real life usage rather than the “speeds and feeds” model that trips up the rest of the industry. 1 That’s why I was surprised that Apple introduced the Watch with a gadget-y demonstration of features. The world needs more than “it does stuff” as a marketing message – can you imagine if the Rolex tag line was “it keeps time pretty well”? Despite this marketing stumble, there is an implicit message to Apple releasing a Watch. To a huge number of people, the Apple brand connotes fashion, design, quality, and a priceless cool factor. 2 This isn’t the Apple WATCH, it’s the APPLE Watch and that’s all that matters to many buyers. Furthermore, the Watch adds a new element for Apple products with its three different price brackets. Previously, just owning an Apple thing was enough to secure bragging rights. With the Watch, there are tiers of status beyond Apple, including the hyper-exclusive gold Edition models that have already been appearing on the wrists of the glitterati that so many of us either love to hate or hate to love. Clearly the Apple Watch is a piece of jewelry that denotes social status. But we knew this before it was even unveiled. So what does it actually do? Apple seems at a loss to explain this, offering up a scattershot of use cases from the reasonable (Up – “it’s a sports band”) to the insipid (Us – “sweeties sharing heartbeats”) to the questionable (Rise – “do stuff all day”). Realistically, Apple has no more idea than any of us what the Watch is for. They’ve suggested what it might do, but it’s an extensible platform and no one knows where it will go. Remember that the iPhone was introduced as a “widescreen iPod with touch controls”, a “revolutionary mobile phone”, and a “breakthrough Internet communicator”. Would you use these terms to describe what it has become today? Apple introduced a cool thing that does stuff and the world decided what it was, and the same will happen with the Watch if it gets the chance. Today, the Apple Watch is mainly an extension of your iPhone. Some things it does are very useful (Siri, notifications, directions) and everything else is more promise than reality. Even the obvious sports band use case is waiting for better software. Regardless of the promise it shows, an Apple Watch is a physical thing for sale today. Let’s turn for a moment to what this Apple Watch is like rather than what some future descendant might be. Note: I’m a watch nerd! There will be watch jargon here! I purchased a stainless steel 38 mm Apple Watch with the Classic Buckle strap. I selected this size because I prefer smaller watches and expected it would “wear” large due to the bubble back sensor, high lug placement, and rectangular shape. The steel model includes a sapphire crystal, has better strap choices, and isn’t much more expensive than the aluminum unless you get the metal bracelet. The Classic Buckle is the most “normal” strap choice and was a logical selection sight-unseen. I’m very pleased with the materials and physical construction of my Apple Watch. The steel is flawless and the Watch is perfectly assembled. Even under the loupe, I see no defects in workmanship, and this is not something I can say of many $650 watches. I love my Seiko watches, but they typically have a rough line or slightly misaligned seam somewhere. The extreme simplicity of the Apple Watch design certainly helps, but it’s obvious that the company sweated the small stuff and that’s very good. The Classic Buckle strap is excellent. The leather by ECCO in the Netherlands is extremely supple and top-quality. It’s so good that many people will likely think it’s actually rubber, an impression bolstered by the embossed and exaggerated texture. The buckle is a new, modern design (despite the name) that would be right at home on a TAG Heuer or a Hublot. Seriously! The Classic Buckle just might be the best part of the Apple Watch. The Classic Buckle strap is really fantastic! But there are some misses. In the world of watches, an inordinate amount of energy goes into fancy presentation boxes. The more expensive the watch, the bigger, heavier, and fancier the box. 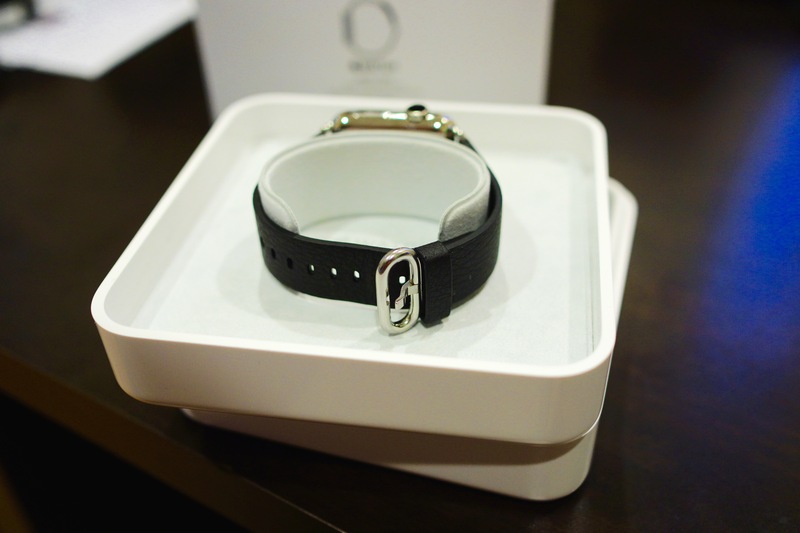 4 The steel Watch comes in a bigger, heavier box than the aluminum Watch Sport, which is nice. But the box itself is a cheesy plastic affair that fails to do the watch justice. It’s slickly taped closed but begs to be opened with two hands. This is bad because the watch sits sideways inside with nothing holding it in place. So it tumbles on the floor. The controls are pretty confusing, too. In the introduction, Apple wisely noted that iPhone-like touch controls aren’t great in a watch, since your fingers get in the way. So they “invented” the digital crown and included a second button to boot. Yet most essential interactions with the Apple Watch involve your big, chubby fingers on the screen anyway. The digital crown is mostly used for secondary interactions and they vary by app – is it for zooming, scrolling, or selecting? And I have yet to press that other button in anger, since it only calls up a list of contacts. Initial setup seemed very slick but failed in my case. I was able to pair the phone using the camera and a lovely pattern on the Watch but was then faced by screen after screen of additional steps that were nevertheless incomplete. For example, Apple Pay setup is manual and fiddly yet is one of the primary functions of the Watch. And in my case at least my third-party apps never completed syncing to the watch so I had to go in one at a time and individually remove and re-add them. Up and running, the Apple Watch is pretty useful. Notifications give you a nice little thump and beep and you can often respond right there. This is especially true of iMessage, which is simply wonderful. I would rather text using the Apple Watch and Siri than any other interface! Right now, iMessage is the most useful thing to do with an Apple Watch. Other apps are less useful. Many iPhone app notifications can be duplicated to the Watch but these are often frustratingly incomplete in terms of interaction. You see the notification but can’t do anything with it, especially in the case of apps that don’t yet have an Apple Watch component. And those that do have apps vary from awesome (Instapaper, 1Password) to pointless (Twitter) to non-functional (United). This will get better as developers become used to the Watch environment and create apps for it, but it’s annoying on day 1. What Does the Apple Watch Mean For the Watch Industry? Watch geeks have long sneered at smart watches, but the Apple Watch will likely affect the watch industry more than they want to admit. Neither of these tasks will be easy, but let’s assume the Apple Watch becomes a successful trend. What would this mean for the watch industry? Some wearers-of-nothing could be drawn in by the Apple Watch and then “graduate” to a luxury watch or other wrist jewelry. This has happened before: My generation was born on digital watches and gadgets yet have become the heart of the luxury mechanical watch market. Casio and Swatch was a gateway to Jaeger-LeCoultre! And I see the same kind of enthusiasm for hand-crafted mechanical watches among my peers. Sure, not everyone wants a fine watch. But the market is booming right now! Apple’s Watch could convince people to start wearing watches. And if the device fails to achieve sustainable success, they could move on to a luxury watch next. 6 It could even spark a frenzy of iconoclasts buying mechanical watches as an antidote to the Apple masses. But it’s not all good news. As watch salespeople lament, most watch buyers are not watch nerds. Most see a fine watch as a piece of luxury jewelry that signifies their taste, status, or wealth. These buyers will snap up trendy Apple Watches in droves, and this will be a serious problem for fashion and mass-market watch brands. As long as it’s trendy, an Apple Watch will occupy the wrist space once claimed by the likes of Gucci or Diesel. This buying shift could cause serious harm to watch brands like Citizen, Seiko, Bulova, Movado, Hamilton, Tissot, and TAG Heuer that rely on mass-market jewelry counter sales for the bulk of their revenue. Even Rolex could feel a pinch if wealthier buyers decide that an Apple Watch is more of a status symbol than a Submariner or a Datejust. Omega, Breitling, and especially Montblanc are similarly exposed if that shift occurs. This photo caused the watch nerds on Reddit to squeal in horror! The Apple Watch is much less of an issue for serious horology companies. They already rely on a minuscule market of watch connoisseurs, and it’s likely that these buyers won’t switch en-masse. 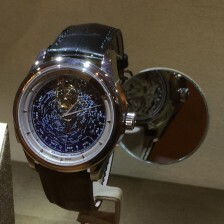 Buyers don’t pick Jaeger-LeCoultre or Zenith for attention, since average people have never heard of the brands. And the big guys (Patek Philippe, Audemars Piguet, Vacheron Constantin and the world of exotic haute horology) have nothing to fear. These companies should be focused on the free-floating Swiss Franc, the low price of oil, and “peak China” rather than the Apple Watch! As both a watch and gadget nerd, I am impressed by the Apple Watch but I would not recommend buying one yet. Although it’s a wonderful object and achievement, it’s not actually all that useful as of the first month of availability. This is not a shock; it’s brand new; it will get better. I want better apps and I want better interaction, especially with the button and digital crown. But the fundamentals are in place for the Apple Watch to transcend the smart watch market to become a meaningful device.